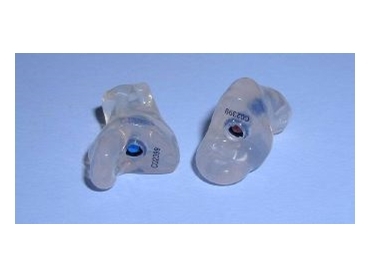 Elacin earplugs -- tailored to each indivdual user. THE Elacin Hearing Protection range of moulded earplugs, currently imported from Holland, will be manufactured locally within the next few months by Elacin’s Australian agent, HearingTech Pty Ltd .
HearingTech plans to start manufacturing Elacin custom-moulded earplugs early in 2003 from its factory in Melbourne's outer east. "The local manufacturer of the Elacin FlexComfort hearing protectors will enable us to provide a faster service to our customers, who come from a wide range of manufacturing applications," HearingTech manager Jan Van Kooten said. Each pair of Elacin earplugs is made from medical grade silicon, based on a cast of the user's ear canal, to ensure maximum comfort and noise protection. A choice of six filters is available depending on the noise levels of the work environment. "In addition to being tailored to suit each individual user, another unique feature of the Elacin range is the ability for the wearer to still hear voices and alarms, which is imperative to worker safety," Mr Van Kooten said. A full range of HearingTech products, including the Elacin FlexComfort hearing protectors, will be on display at National Manufacturing Week (NMW), May 20-23, 2003, Melbourne Entertainment and Convention Centre.